Busy at work and need help with dog care? You can find a perfect pet sitter offering doggy day care in their home on Pawshake. Pawshake knows you want the best dog care for your furry friend. Our pet sitters are highly experienced and can provide in-home dog care services when life gets hectic. Not all pets enjoy staying in a crowded doggy day care centre. Instead, many prefer in home dog day care in the comfort of a cosy, secure environment. Our pet sitters don’t operate like a traditional dog day care centre – instead, you can choose the individual pet sitter who will be providing one-on-one dog day care services for your furry friend. Does your dog not get along with other dogs? Arrange dog day care with a pet sitter that only takes in single bookings at a time. Alternatively, your dog can make new friends during doggy day care – but usually only a maximum of 2 or 3 dogs at a time. Why is doggy day care great for your dog? Dogs are social animals that need companionship, so most don’t enjoy being left alone during the day. Being alone for long periods can lead to stress and even separation anxiety, but this can easily be avoided by booking dog care services through Pawshake. Your sitter will keep your pooch happy during the day with plenty of love and belly rubs! We had a great day in Paris thanks to Viktoria. We can recommend her to everybody who’s looking for a reliable address near the city center. Viktoria communicates fast and was really friendly to our dog. Read more about Paradise For Pets! Our pet sitters are trusted, experienced and vetted locals who simply adore dogs. In addition to dog care, many Pawshake pet sitters can perform extra tasks, such as grooming and administering medication. Feel great knowing your pet is covered by our Premium Pet Protection insurance during the booking, too. Enter your street or postcode into the search bar on the Pawshake home page or app, and select the service ‘doggy day care’. You can then easily browse local sitters who offer personalised dog day care. Use our handy search filters and date-range options to make sure you quickly find a host that’s perfect for your dog care needs. A dedicated pet sitter is a great option for in home dog day care when your family or friends are too busy. 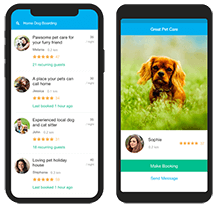 Many pet owners are uncomfortable asking their neighbours for dog day care help: a Pawshake pet sitter will be happy to provide dog day care when you can’t. Pawshake pet sitters are genuinely love pets and are there to help with your dog day care needs. Using Doggy Daycare for the first time? With a few simple steps, you can feel relaxed knowing that your pet sitter will do the best job possible. Enter your suburb into the Pawshake search and your dates to explore the many available sitters in your neighbourhood. Read all about your pet sitter’s past dog care experience on their profile and browse through reviews from previous customers. If the pet sitter looks promising, send a message with your requirements. Always arrange a meet and greet with your pet sitter before formalising the booking. Take your time in getting to know each other- ask your pet sitter questions, introduce your dog, check their space to make sure it’s right for your pet during the doggy day care period and answer any questions. If your meet and greet is a success, return to Pawshake to make the doggy day care booking. This will activate our premium pet insurance coverage, the Pawshake guarantee and the support of the customer support team. Payment will be sorted out at this stage too and transferred to your pet sitter at the end of the booking.